Are you ready to #FollowGriz . . .
Don’t go out into the wild, overgrown world in search of your best-friend unprepared. Enter to win our A Boy and His Dog at the End of the World bundle. Including a compass, a poster of the British Isles, an ‘adventure’ pouch, a ‘dog person’ pin and a copy of A Boy and His Dog at the End of the World by C. A. Fletcher. I agree to enter the prize draw on the terms set out in the Terms and Conditions and I have read the Privacy Notice. Orbit is an imprint of Little, Brown Book Group Ltd and the data controller is Little, Brown Book Group Ltd. You can unsubscribe from the Orbit newsletter at any time via the link in any email we send you. By ticking this box, I acknowledge that I have read and agree to Little Brown Book Group’s Privacy Notice. This is a prize draw to win a copy of A Boy and His Dog at the End of the World by C.A. 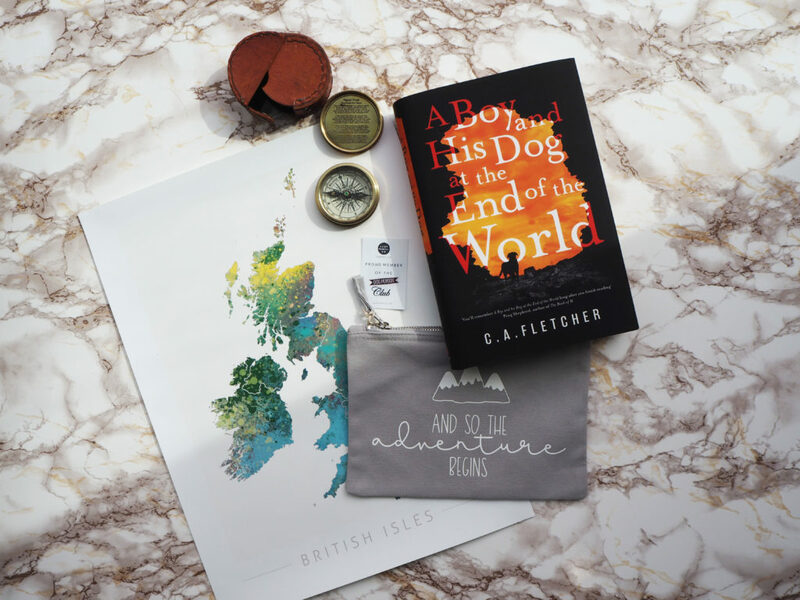 Fletcher, a poster of the British Isles, a compass, a canvas pouch and a pin badge. To enter, please fill-in your name and email address in the giveaway form, read the full terms and conditions and check the box to say you’ve done so. The one winner will be selected at random from the entries received in accordance with these terms and conditions by a member of the Little, Brown team, whose decision will be final and no correspondence will be entered into. The prize draw opens at 12:01 am GMT on 05.04.19 and closes at 11:59 pm GMT on 31.04.2019. Any entries received outside these specified times and dates will not be eligible for entry into the competition. The prize draw is open to residents of the UK aged 18 or over except employees of the Company, their families, or anyone professionally connected to the prize draw either themselves or through their families. The Company is the data controller of Personal Data that it collects in the course of running the prize draw and will use the Personal Data in accordance with the Company’s Privacy Notice https://www.littlebrown.co.uk/Information/Privacy.page It will use such Personal Data for the purposes of running the prize draw and delivering any prize and will delete it after a reasonable period from the end of the prize draw. “Personal Data” means names of entrants and other details provided by them (e.g. email addresses, telephone numbers) for the prize draw. The Company will not share such Personal Data with any third parties except for the purpose of delivering the prize. Where entrants have opted-in to receive communications from the Company, the email addresses of entrants will be used by the Company in accordance with its Privacy Notice https://www.littlebrown.co.uk/Information/Privacy.page to send news about books, products and promotions and to invite entrants to participate in surveys. Entrants will be given the option of opting out in those emails if they don’t want to receive any further communications. Look, I know the temptation here is to improve your odds by keeping this sweepstakes secret, but you don’t want to incur devastating karmatic retribution. Avoid such perils as: an audit by the IRS, unexpected visits from your in-laws, and radioactive ants* by telling your friends and family about this sweepstakes. * Disclaimer: Orbit cannot actually protect you from any of the aforementioned perils – particularly radioactive ants. If you find yourself facing a swarm of these, it is our professional recommendation that you run.